Storage is a necessity in life. However, storage doesn’t have to be something that is put out of sight or a closet. It can be an integral part of the design in a room. We have assembled various cabinets we’ve used in projects that all served different purposes and visually enhance the space. Take a tour with us below as we outline each piece and how you can find something that works for both your storage needs but is also a delight to look at every day! This Jonathan Adler Talitha credenza is unfortunately no longer produced. However, Jonathan Adler is a great source for fun and vintage style cabinets without paying vintage collector’s pricing. This one sits in a busy hallway of a Tribeca loft. It serves as a display for art and a place for a few more soft light sources (when you don’t want to use the recessed lighting overhead). 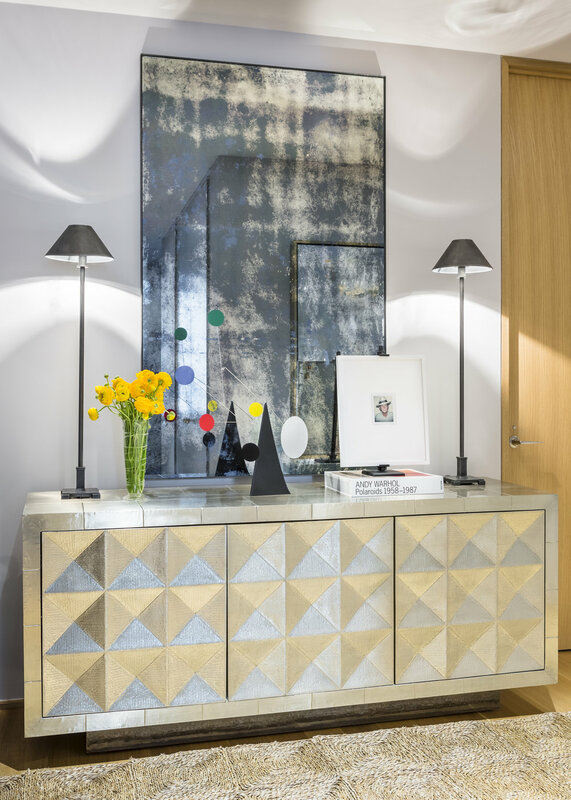 The mirror makes this whole area a “design moment” in the home instead of something you just pass by. This vintage leather top desk by Ole Wanscher was repurposed when the client moved homes. We turned it into a display space in the living room instead of its original purpose in the office. While it doesn’t have “storage” in the traditional sense it does have some drawer space for small things you might need in the living room- matches for candles, keys to drawers, extra coasters and it now “stores” the owner’s collection of art books and African masks. Another vintage piece. This cabinet is American made and was found on 1stDibs. It’s a bar cabinet, and the top opens to expose a mirrored cavity that stores liquor bottles and glasses. This cabinet is used in a client’s library. The side doors hold CDs and other knickknacks. You can find something similar from 1st Dibs here. Who wouldn’t want to make after work cocktails while listening to their music collection in this space?? Yet another vintage piece. Can you tell we adore furniture pieces with history? This is a rare Florence Knoll wall hung cabinet. Here it is used instead of a dresser in a master bedroom. The sliding doors conceal drawers behind them. What we like about this so much is the fact it floats off the ground and makes the space feel lighter, which is important when designing bedrooms with a smaller footprint. This cabinet is a current piece you can find at Design Within Reach. It’s very petite and works perfectly as this client has it in their entry. It serves as a nice place to put down keys and mail and the cabinet stores winter accessories- gloves, hats, scarves, etc. Its small scale makes it easy to get around in such a busy entryway while not sacrificing storage that we all so desperately need in NYC! What are your favorite space saving options that don't sacrifice style? Let us know in the comments below.